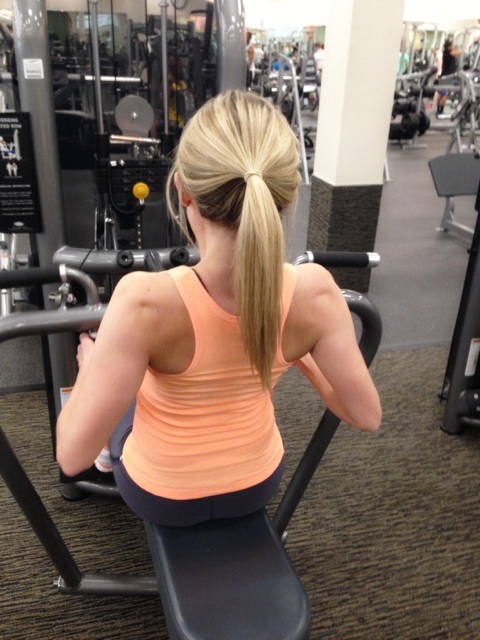 A while back I did a post on upper back workouts (here) that would help your posture. 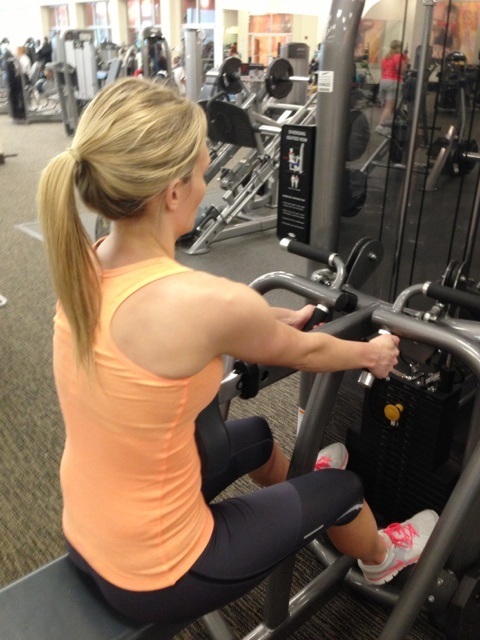 I'm constantly working on my posture, so I love doing back workouts!! The thing with working out is, you don't want to always do the same thing over and over again. Muscle "confusion" is important so that your body doesn't plateau. That's why (ladies) it's important to go up in weight rather than just lift 5 pound weights forever. It will only do so much for you. There are a few different ways to do these back cable pulls, but for this workout sit on the bench with both feet on the floor. Attach a two sided rope to both cables, and pull towards your ears. (Like second pic below.) 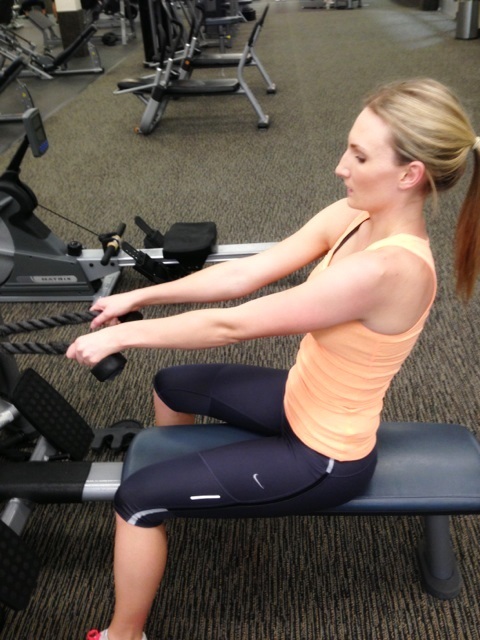 Place hands over the rope (instead of under) Pinch your upper back together as you pull back, and make sure you keep your abs tight. Below I'm only using 12.5 lbs which gives you a burn quicker than you'd think! I did 3 sets of these at 12 reps each (while super setting with Tricep Dips). Pick a weight that is comfortable but still difficult. You don't want your hands flying to the back of your head because its so easy! You should feel the burn in the middle of your upper back as well as your Traps. I'm not 100% sure the exact name for this machine, but it basically does something very similar to the upper back cable pulls. The difference with this, is you'll feel the pinch in your Lats as well as your upper middle back. Put your chest against the pad in front of you, and grab the lower handles (to make it easier use the top handles.) While keeping your chest against the pad, pull back making sure to pinch your middle back together. Try to keep your elbows as close in as possible. You don't want them sticking out too far. I used 45lbs on this machine and 3 sets of 12 or more reps each. I usually just keep going until I can pull back all the way anymore. That is called going past failure, and it is when you'll get the best results. 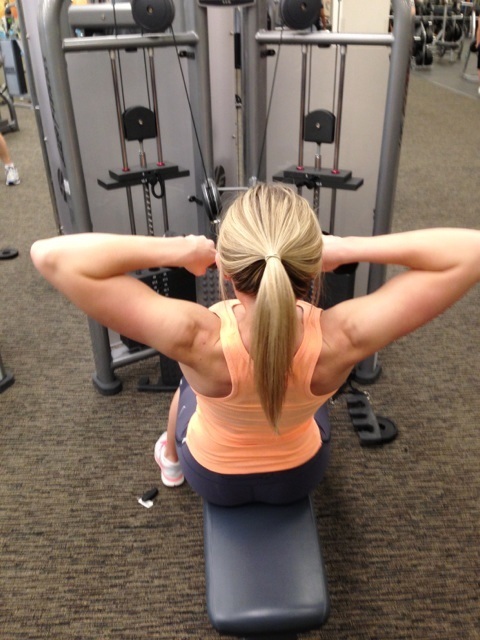 I supersetted these back rows with Weighted Oblique Side Bends. It's important to superset a different muscle group, to give your muscles you just worked a short break. You'll notice when you do this, that the next rotation you'll be able to lift what you did before with the same energy. You won't feel as worn out as you would if you try to do everything together at one time.